Discussion in 'iPhone and iPad Games' started by Repulsa, Dec 14, 2016. 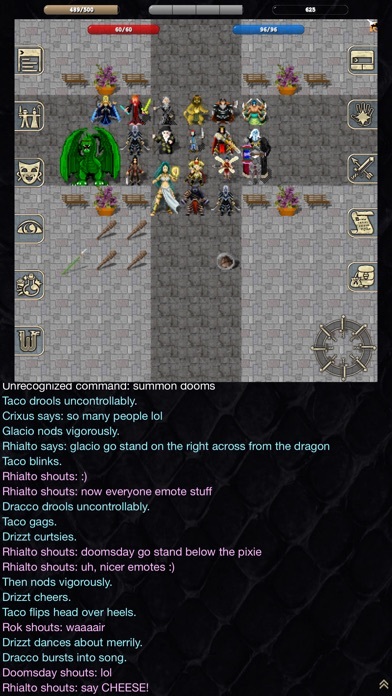 Please note that Wyvern is not optimized for the iPhone 4S, iPhone 5, or iPad 2. 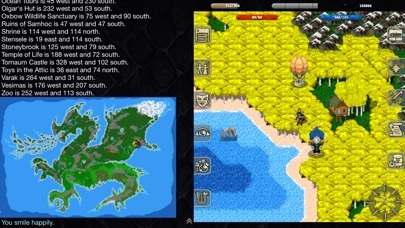 Wyvern is an indie multiplayer, fantasy/adventure role-playing game designed for mobile. 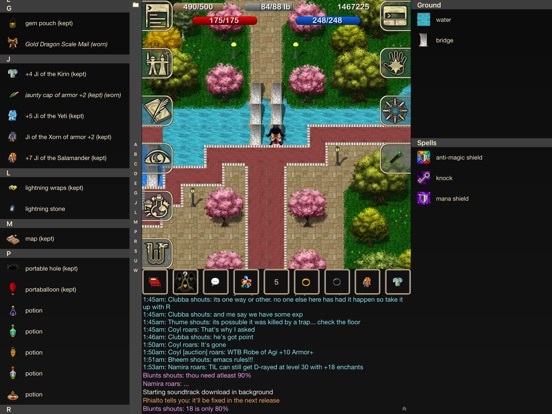 It has a retro look and feel, with old-school graphics reminiscent of late-1980s games. Despite its simple appearance, Wyvern is vast and exciting. 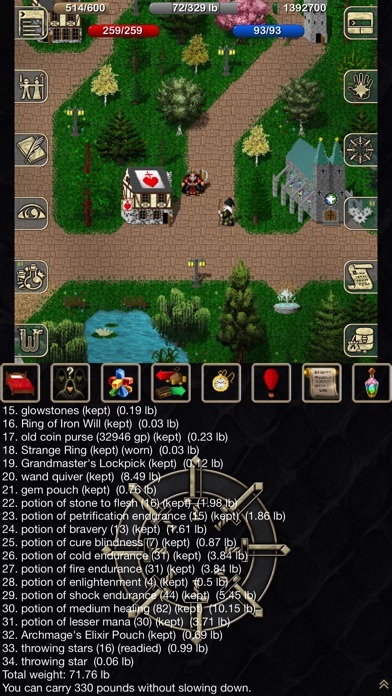 FEATURES: * Sixteen player races and over 40 character types with different abilities * Thousands of handcrafted maps to explore * Dozens of handcrafted quests * Hundreds of unique monsters and enemies to challenge you * Seven playable Guilds that boost your skills and abilities * A rich magic system with over 150 spells and powerful magical specializations * Many trainable skills to develop your character * PvP combat arenas * Player-to-player merchandise auctions * Random dungeons for limitless content * Personal homes, and a Builder Mode for customizing and creating new maps * Adventuring groups with support roles * Strong community features: chat channels, in-game messaging, mail and more. NOTE: Wyvern offers some in-app purchases for convenience, but many of our highest level players got there without any in-app purchases. You can disable in-app purchases in the Settings on your device. Item not available in the US AppStore, so I'm not sure if it's still just working it's way through the system or if it's not releasing in the US store yet. Weird! I caught it in the us store this morning searching RPG in most recent games. 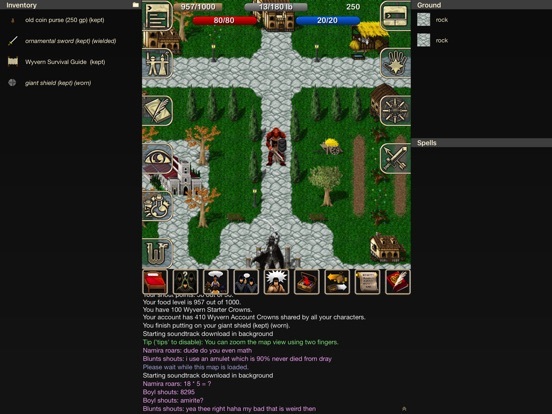 I think this is already a PC game, it looks really cool a premium old school style mmorpg with a premium price tag. It appears to have disappeared from the App Store for the moment. Let's hope it returns soon. I think it got posted early. Oh no so it's NOT coming out tonight? I don't know what the heck was going on but this appears to be back in the App Store now. wow, and i can't play this on my iPhone 5? why?.. "You can play for free after buying the game" hmmmm, capitalism in its finest form. Playing on iPad Pro. The map/ play area is extremely small. Anyone know how to enlarge? Solved. Two finger pinch to zoom. If anyone remembers this far back, is this game similar to something like Kingdom of Drakkar or Legends of Kesmai? Looks similar from the screenshots. This game appears to have some age to it, and a pretty good pedigree. Happy to drop $2 to give it a try, especially considering it's the only game released tonight that didn't look painfully "mobile." So this game is online only? I have to say I'm intrigued by the screenshots. Seems it's more of an old school MMORPG. The play area is super small on my iPad Pro 12.9". Apple Pencil is a godsend - precise input vs my fat fingers. I'd also like to shut off the music (the option to turn it off doesn't work, at least in my limited testing). I'll report back when I have more time. Otherwise, I need to take some time to work through the tutorial - it looks like a lot of fun! This thread was brought to my attention from seeing my site http://wyvernsource.com gain traffic from this forum. Disclaimer: I am not the creator of the game, but have been a fan since 2001 when I was still in middle school. 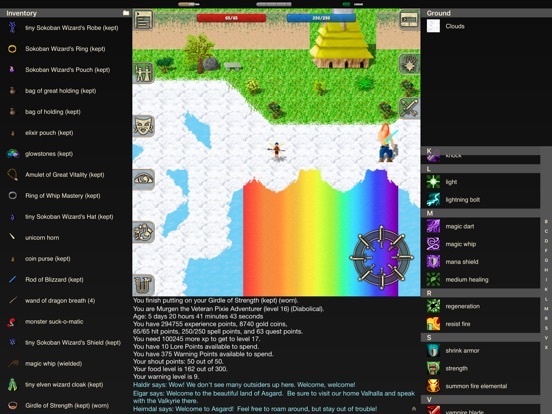 Wyvern used to be a PC game, and had a huge cult following of a few hundred players. 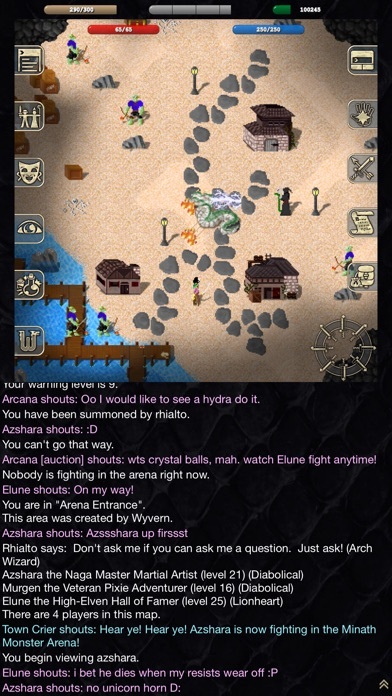 And by cult, I mean we literally waited since March 2011 when the game went down for what we thought the final time, checking it's status daily, until Steve Yegge (the creator, known as Rhialto in game) finally announced it will be coming back but on mobile devices, namely apple devices, first. 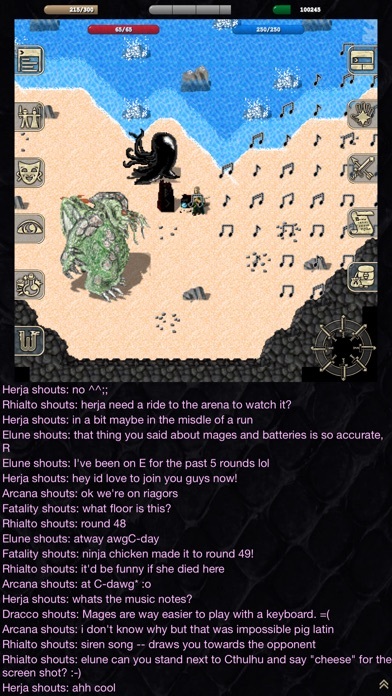 It's been a somewhat smooth transition from PC to mobile, and as a keyboard user myself, there is a lot to still be improved on, but Rhialto is very active and takes feedback from newer players who don't have the privlage of having played on the PC a long time ago more seriously than feedback from us vets. So feel free to head over to http://reddit.com/r/wyvernrpg and let Rhialto know how you feel about the game. 1) The controls are very responsive. This game isn't slow. you have to move during combat, and dodge monster's breath spells or other attacks or you will simply die. The game is hard, it isn't for everyone, and it will punish you for not being prepared (like not having fear/fire resist when fighting a red dragon). 2) You never stop improving your character. Every level you will get skill points to allocate to the many skills in the game. Even at the highest level, there is rare gear that everyone will fight over. Live Quests, a feature in the old version of the game, will be making a return soon as well where everyone fights a huge boss monster at once and the player who did the most damage to it wins the quest and the rare reward. To put this in perspective, I am the highest level in the game currently, sitting at 48/50, and I am still finding gear that I can improve my character with. Glad you all seem interested. Obviously I'm a huge fan, as I created a site dedicated to the game while having no obligation or ties to the Ghost Track company to do so.